That’s not the hero of Portal, that’s merely the player’s avatar. The REAL hero of Portal is the Weighted Companion Cube. 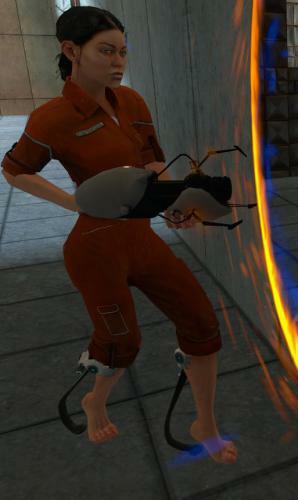 the TRUE heroes of portal are the turrets. i miss mine too. :*( lol i think that was the saddest moment in video game history. They say those springs are so that her feet are protected from falls. But looking at them I think they would do horrible damage to the soles of her feet and maybe even punch through.